Calculator+ is a Scientific Calculator App for Windows 8 and 8.1 computers. It is published by Jonas Zoche for the purpose of basic, as well as complex calculation. It is a free scientific calculator app for Windows 8, which can carry out different sophisticated mathematical calculations. You can add up to 14 digits for processing in this scientific calculator. It can calculate in Binary, Octal, Decimal, and Hexadecimal values. 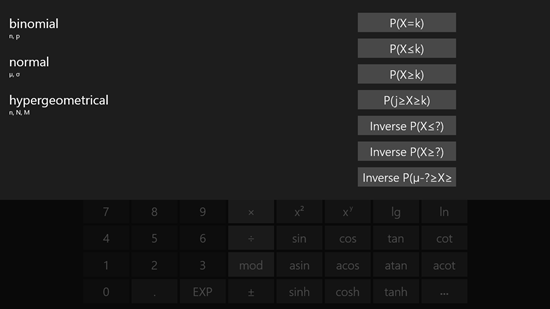 This Windows 8 calculator can also calculate logarithm, and roots to an arbitrary base. It supports various trigonometric functions like Sine, Cosine, Tangent, and Cotangent. It also has a function of a converter. This scientific calculator is available in Windows App Store. 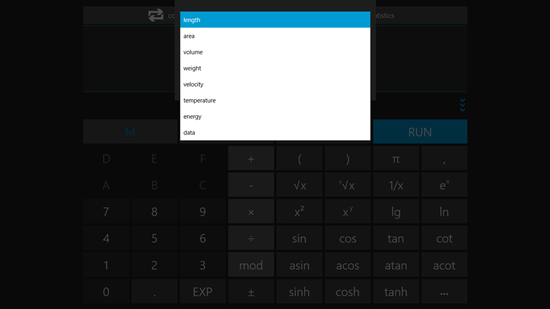 Go to the Windows App Store, and then search for Calculator+. Click on the Install icon to download and install this free scientific calculator App for Windows 8. This app will barely occupy any space on your computer, as it has a size of 541 kB. Scientific Calculator provides the user with almost all major mathematical terms. It lets you carry out various mathematical calculations, like: Trigonometric, Exponential, arithmetic, etc. You can also use Brackets, and simple Logarithm function in it. Unit Converter is a very helpful feature added to this application. You can convert different values from one unit to another. These measurement units include: Length, Area, Volume, Weight, Velocity, Temperature, Energy, and Data. Simply select one of the above parameters from the drop down list, then select the conversion units, and click on the Check option. You will be redirected to the main calculator screen of this Windows 8 Scientific calculator. Type in the number of units which you want to convert. For example, if you want to convert 3 kilo meters into centimeters, then type in 3, and hit RUN to obtain the result in centimeters. Statistics provides predefined functions in form of binomial, normal, and hypergeometrical. The equations present under these functions are: P(X=k), P(X<=k), P(X>=k), P(j>=X>=k), Inverse P(X<=? ), Inverse P(X>=? ), and more. 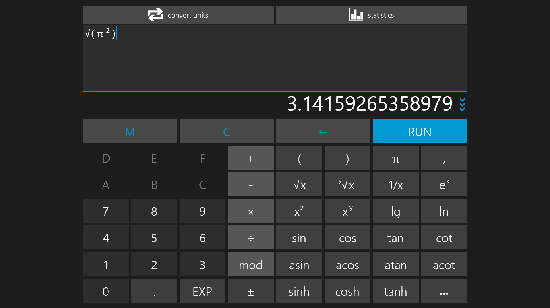 This Scientific Calculator App for Windows 8 has a very simple interface, and is one of the best apps in the Windows 8 App store which can replace regular calculators. This Application can also save your calculation in its history file. So, if you want to see what you have calculated before, you can check Show History option in the dropdown list just below the writing panel. 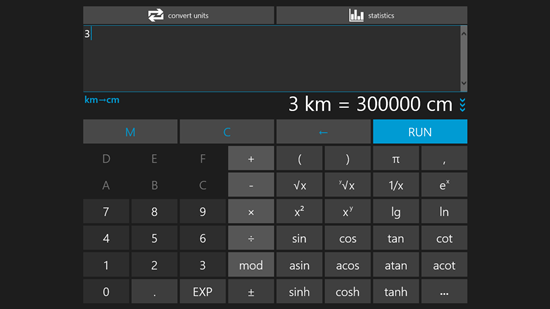 Calculator+ is compact, precise, and fast Scientific Calculator App for Windows 8. It provides maximum mathematical calculation features in it. This free calculator is worth using for any domestic, or professional mathematical use. I rate this application 4 out of 5. Download Calculator+ for Windows 8 and 8.1 computers. 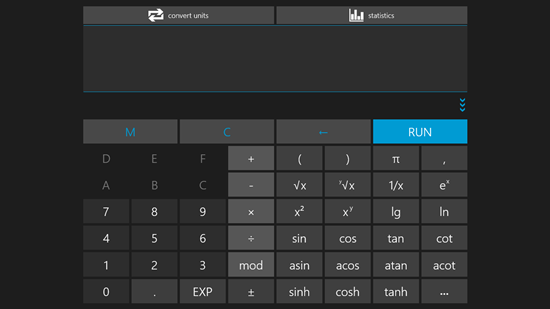 You can also check out Calculator Plus, or Calculator Free apps for Windows 8 and 8.1.